Growing Cashews, All You Need to Know About Cashew Cultivation…. Thinking of starting a cashew plantation? No worries, you are at the right place. Let us understand the basics of kaju/cashew farming. Cashew nut cultivation requires some specific climatic and environment conditions. We will learn all from the scratch in the coming sections. Cashew trees are grown mainly in the tropical regions. Brazil, Vietnam, Africa, South East Asia and India are the major cashew producers in the world. Kaju tree grows to a height of about 10-12 meters. It’s a fast-growing tree. After planting the seed, it usually starts flowering in the 3rd year. Fruits start blossoming in the winter season and ripens fully in 2-3 months. The cashew fruit has two parts – the cashew apple and the nut attached to it. Don’t get fooled by the appearance. The nut attached to the cashew apple is the real fruit of a cashew tree. The cashew apple is just swollen stem of the fruit. Like every crop, cashew plantation too involves some special requirements. Proper sunlight, sandy soil, water and fertilizers are the major requisites for cashew nut farming. Let us discuss this in detail. Sunlight is very critical for proper growth of cashew plant. 5-6 hours of direct sunlight results in high cashew yields. Cashews grow well in sandy or laterite soil where water do not stagnate. Soil with slightly acidic to neutral pH is always preferred. Excessive alkaline or saline soil should be avoided for cashew farming. Clayey soil should also be avoided for cashew nut farming as they cause stagnation of water. Regular watering helps in increased production of cashew fruits. This is very important as the sandy soils do not hold much water. Adjust the amount of water as per the season, more frequent water during summer and less during winter. Make sure, you don’t over water cashew trees. 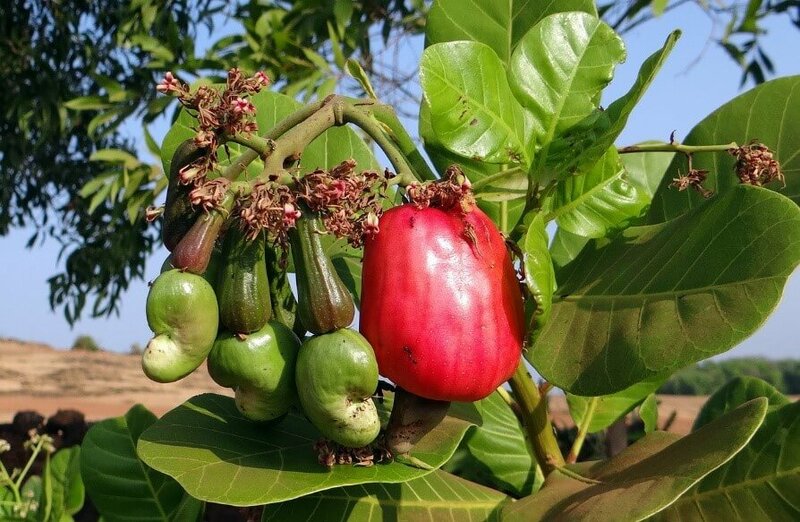 As the sandy soils in which cashew trees grow are comparatively less fertile, it’s important to have active fertilization for your cashew farming. Fertilizers rich in Nitrogen and Phosphorus are essential during the flowering and growth stages of cashew. 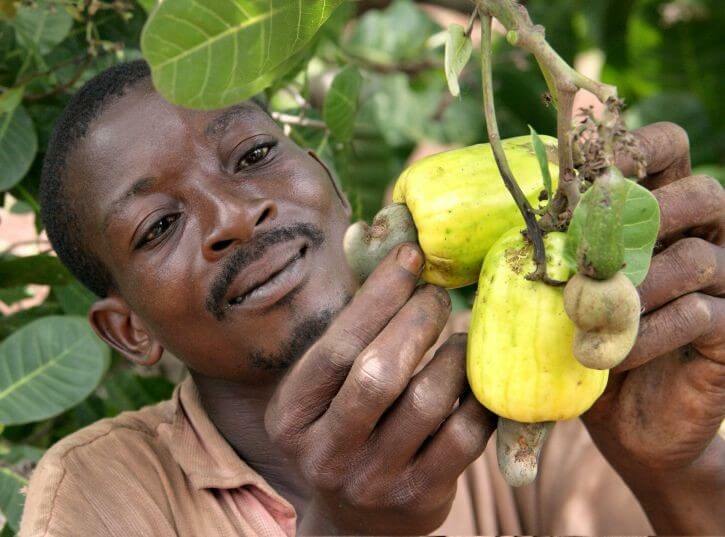 So far, we have seen the major facilitating factors for cashew tree growth. Let us also see, what are the suitable climatic requirements for cashew farming. Cashew farming can withstand moderately high temperatures. A monthly mean of 25 degree would be optimal. Cashew can tolerate drought conditions and an annual rainfall of 1500 to 2000 mm would be optimal. Heavy rainfall during flowering season is detrimental for cashew farming. How Do We Grow Cashew Trees? Let us see what are the various stages in cashew tree plantation. Prepare Land for Cashew Cultivation – Cashew cultivation is done in leveled land with the soil and sunlight requirements as mentioned before. In case of sloppy land terrace cultivation is preferred. Soil trenches are dug in order to increase moisture in soil. This work is done mostly just before the monsoon season. Initial Planting – Initially, fresh seeds are taken and are planted in plastic bags filled with loose soil. These bags should be sufficiently deep as to provide space for the growth of roots. 350-400 mm depth would be appropriate. Cashew plants are allowed to grow in this way for first 2-3 years. They are allowed to grow under shade. If the place is windy, it’s better to provide supports for your plant. A planting distance of 8*5 m is recommended during this period. Replanting in the Prepared Land – After it’s vigorous growth for 2- years, cashew tree has to be replanted to a permanent location While replanting, it’s very important that you do not disturb the root system. As a common practice, they are replanted to a distance of 10-12 m.
With proper irrigation and fertilization, you can have high production from cashew trees. Cashew trees will begin flowering and bearing fruits during the winter season. After that in a few months, you could find your cashew trees full of cashew apples. As we have already discussed the cashew fruit has a nut attached to it (which is the real fruit). You can wait for the cashew fruit to fall down on the ground by itself. This means your cashew nut is ready. Separate the cashew from the apple and store it for processing. You don’t have to process them immediately. Every batch you pick up can be stored in a cool dry place for a period up to 2 years and can be processed in bulk. They are dried under sun for a few days before storing. Cashew fruits need not be thrown away after separating nuts from them. 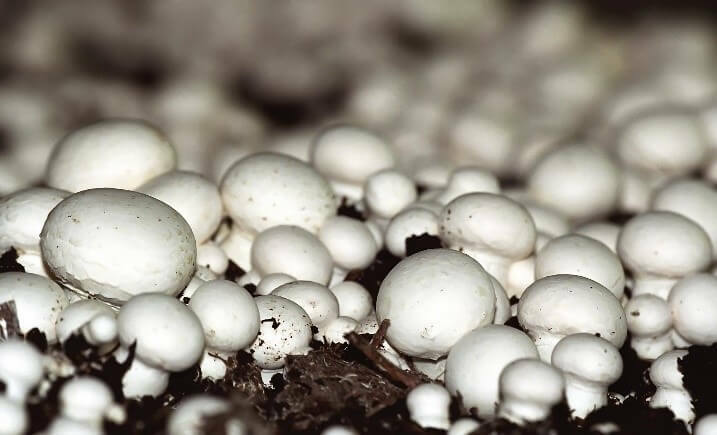 They are in fact excellent sources of nutrition with Vitamin C, Vitamin B1, Calcium and Iron. And they taste good too. After harvesting there is another important step in cashew farming. That is, cashew processing. Let us see that in detail. Let us understand the purpose of these processes and how they are accomplished. Roasting – Before understanding what is roasting and why do we do roast cashew, let us see what shelling is. Shelling is the process of separating the nut (the inner kernel) from its outer shell. But the process of shelling is not that easy as the shell is made up of some caustic liquid which could burn your skin. So, roasting is a prerequisite before getting into shelling of cashew nuts. Nuts are heated for about a minute in open pan containers with holes. Acid fumes will be released and the caustic shell oil flows through the holes and can be collected in a catchment area. Avoid contact with the caustic shell oil obtained during the process of roasting. It can severely affect the membranes of mouth and throat. Also avoid inhaling the acid fumes emitted during the process of roasting. Shelling – There might be still some traces of caustic oil in the shell which can be removed by mixing them with saw dust or ash. After the removal of the caustic shell oil, nut is ready for shelling process. Shelling is mostly done manually with the help of special mechanical devices. Machines are usually avoided as it leads to damage of kernels. Grading – Kernels obtained after shelling are graded usually into 6 categories. Broken kernels cannot be sold in export market. So, obtaining whole kernel during the process of shelling is very important. Packaging – For better shelf life, kernels are dried to 3% moisture content before packing into vacuum packed tins. Cashew nut has great demand in the export market. The major buyers of cashew in the overseas market are the United States, Japan, Australia, Canada and countries in middle east. From the above cashew nut processing, we know there are two major by-products obtained along with the cashew kernel. They are the shell oil and cashew apple. These by-products can be sold in market, as they have many uses. Shell oil is majorly used for the manufacture of materials which are supposed to be heat and friction resistant. It has applications in the automobile industry in the manufacture of brake linings, clutch plates etc. Cashew apple is edible as a fruit or it can be juiced. It’s rich in Vitamin C. Wine, Gin, pickles, syrup etc. are also made from cashew apple. Cashew seedlings can be purchased from Cashew nurseries and replanted in suitable locations. High yielding varieties of cashew can be bought from these nurseries. A seed planted takes 3-5 years to bear it’s first fruit. So, its recommended to buy seedling from a nursery. In this way you would not have to wait for so long. There are farming experts associated with cashew tree nurseries who could help you select the best breed for farming. Make sure your farm is not prone to heavy winds. Maintain the surroundings of your farm clean from weed and debris. Mulching can be done around your tree to prevent the growth of weeds. It also helps in conserving moisture. Use adequate water for irrigation and fertilize well. It’s better to use green manure. Use pesticides if needed. Remove any sick or dead branches from the tree. Branches which are infected with pests should be pruned to prevent the infection from spreading. Cut the entangled branches so that the cashew tree grows at a faster rate. So far, we have discussed some important cashew tree information. There are a large number of high yielding varieties of cashew available in local farms. With an impressive export cashew market, it would be a great time to start cashew farming.